This week, let’s take a look at the obelisk that dominates the great hall of the Sith Academy on Korriban. This pointed monolith has four faces with a swirling mass of twisted visages on two sides and a repeated Aurebesh inscription on the others. 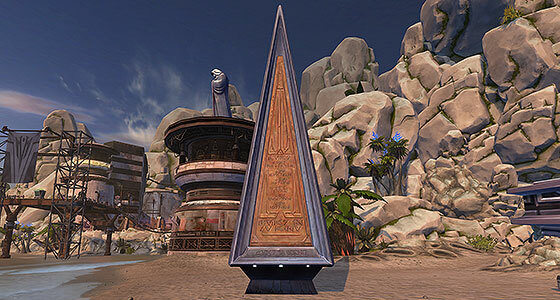 While most players likely first encountered this monument on Korriban it is also available as a stronghold decoration. 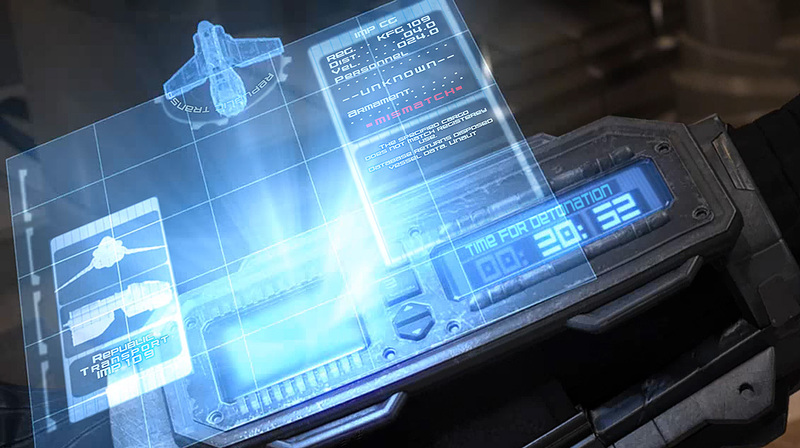 The currency needed to purchase it can be rarely found in the Korriban Incursion and Assault on Tython flashpoints. When my guild unlocked our Sith faction Guild Ship, several of us pooled our hard-won Recovered Relics to purchase the obelisk decoration. Unfortunately, the obelisk is very tall, taller even than the ceiling of the command deck on which we had hoped to display it. Instead we placed a more appropriately sized decoration, and the obelisk gathered dust in storage until the guild purchased the new Rishi Stronghold. While Rishi may not be the most thematically appropriate spot for such a decoration, it was a relief to be able to erect the obelisk in a spot that won’t cause it to poke through the floor into the deck above. The other benefit of displaying it on Rishi is that it’s a bit easier to decipher than in its usual spot in the mist-shrouded hall on Korriban, and so my translation and recreation was done in comfort on Rishi’s sandy, sunny beach. A viewer might think that the monument records the principles of a Sith lord from the distant past. Instead, it does quite the opposite! The words were actually spoken by Darth Maul in a television ad for The Phantom Menace. Regardless of how or whether one might want to explain this rip in the time space-continuum, Maul’s “tone poem” is indeed appropriate for such a colossal sculpture. 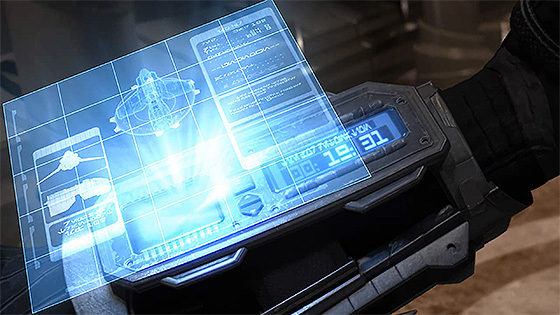 The base of the obelisk is similar to the bases of glowing red and green triangular Sith holocrons found in ancient, Dark Side ruins from Korriban to Oricon. 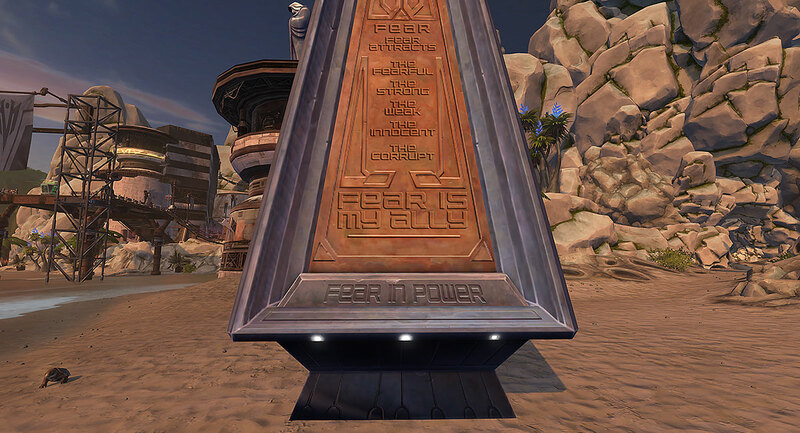 The Aurebesh at the base of the obelisk reads “Fear in power”, and it matches well with the holocrons that read “Power in fear.” This is exactly the kind of circular logic that appeals to the Sith and is nice design touch to tie these monuments together.